Note: we finished this trip in June 2013. Diary excerpt: Some people are drawn to wild places; our hearts beat stronger. Here I see life in all of its vastness, all of its beauty, and its extraordinary depth. My heart dances, it beats stronger in these mountains. Life is stripped to the bare necessities; it’s impossible not to see what is most important. Something about this place vibrates through me, like the sound of the conch shell in morning prayer in Saldang. It flows through the valleys like faded prayer flags dancing in the wind, elevating the soul of everyone who passes through. It’s more than just a connection to nature, but to a culture and community of people with so much history and depth. As I write this, I’m sitting in the Motueka Valley in the South Island of New Zealand, looking out the window at Kahurangi National Park. Mount Crusader is dominating the skyline. The apple trees are full of blossom, the earth is bursting with being. Tuis are rustling around in the cabbage trees, branches are swaying in the wind. I take in the busy but content hum of springtime, surrounded by lush green. In the night time I look at the stars and am reminded of the clear, star-spangled skies over Dolpa. Looking back at my time in the mountainous high-altitude desert, it feels like a dream. I smile at the contrast between the two places. I am reminded of many things. Tibetan butter tea. Yaks grazing on high alpine pastures. Yarsa Gumba collectors. Yak cheese. Dust. Snow melt creeks. Elusive snow leopards. Children smiling. Nepali folk songs. Arid nothingness. Conch shells. Goats bleating. The bells of mules. Stacks of firewood. The smell of juniper rising from roofs. Fossils. The squealing of rice pots. Men quietly spinning wool by hand. I can see the faces of marmots popping up as they sense intruders. Himalayan tahr frolicking on rocky mountainsides. Splashes of rainbow prayer flags dancing on the breeze. Precarious hand-carved wooden ladders leading to the sky. It takes a moment to bring myself back to earth. I am, in fact, back in New Zealand, an almost incomprehensible distance from the arid lands of Dolpa. But like an umbilical cord, and the relationship between mother and child, I am connected for life. It’s as if Dolpa has become part of my DNA. Dolpa is the largest region in all of Nepal, wedged between the high Tibetan plateau to the north and the true Himalaya to the south. Worlds apart from everywhere else, it’s a place where ancient Tibetan culture still survives today. It is also one of the most remote inhabited places on earth, only accessible by crossing high alpine passes when the seasons allow. The first foreigner to ever visit Upper Dolpa spoke of “the summits with eternal snow, the gigantic mass of jagged rocks, the quietude of the place, all of it imposing fear and elevating the soul.” And, more recently, Eric Vali described his excitement of returning to Dolpa as being “drunk with joy and freedom” as he leapt into the air at the top of a high alpine pass. Vali directed the award-winning film ‘Caravan’ which provides a beautiful and raw insight into the people of this land. For many this place becomes like a pilgrimage; a place their heart pulls them back to time and time again. Diary excerpt: After a steep climb, sharing the precarious mountain trail with mules – boom, it appears out of nowhere: Phoksundo Tal. An expanse of turquoise and lapis lazuli waters perched high in the mountains. Water cascades down to the valley floor we just came from and I feel both invigorated and dwarfed by the immense scale of this landscape. A tingle sweeps down my spine; there’s some special fairy dust in this mountain air. I almost expect to see clown fish flitting about brightly coloured coral heads, but as I dive into the water all I find is that it is piercing cold and I am reminded that we are, in fact, high in the mountains. Ringmo, a small settlement on the edge of Phoksundo, was our gateway to the Upper Dolpa region. We stocked up on plain oats and filled our bellies with spicy fried potato before heading to higher altitudes, not knowing when we would next be able to find food. Laden with heavy packs, we ambled along a path winding its way around Phoksundo. In sections, precariously placed planks of wood and rocks extended its width to allow animals to pass through. Soon we found ourselves camping alongside Tibetan nomads, waiting for a high-alpine pass to become crossable. 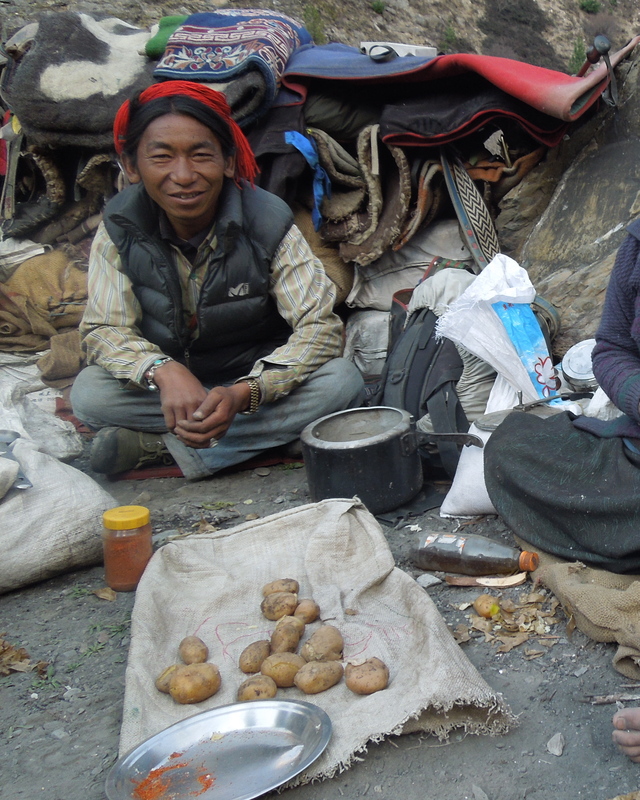 Huddled around a fire, we spent an evening drinking Tibetan butter tea and eating boiled potatoes dipped in chilli. Communication mostly consisted of toothy-grinned smiles and crazy gestures. While we had only backpacks, these families had herds of animals, hoards of grain to keep them sustained during the winter months and small toddlers to bring over the pass safely. As we slid into our fancy sleeping bags and zipped up our light-weight Macpac tent, beside us our new friends shared yak-wool blankets, which they had spun and woven themselves, and sought shelter in a hand-made tipi. We packed up in the morning and a young boy looked on curiously. Meanwhile I observed the women boiling what looked like ordinary grass for breakfast. Discovering sea fossils over 5000m above sea level reinforced the magic of nature, and reminded me that we are merely specks on this planet. Our time is fleeting, the very mountains around us have watched over these valleys for thousands of years. We had waited for two weeks for our first high-altitude pass to become crossable, and even then we were falling deep into the snow on our way down. At some points it seemed never-ending. Spurred on by the hope of a tasty dahl baht in a nearby village, we rushed down the valley, desperate to get to flat land before nightfall. We soon found ourselves on the doorstep of the Llamas house in Shey Gompa, the oldest monastery in Nepal. We had made the first pass crossing of the season, with most of the summer population in this area still stranded in the low lands. At the time we would never have thought we would spend a whole week living with the Llama and his wife. I’ll share that story another time. Shortly after arriving in Dolpa I sat on a mud roof in the afternoon sun, surrounded by stacks of firewood. Stretching out as far as I could see was an expanse of arid, desolate beauty. I wondered how people ever came to live in such an inhospitable, harsh land. What were they thinking when they settled here, where the true Himalaya block the monsoon rains and they cannot grow anything without irrigation? Trees are so scarce that the one real tree I saw was laden with prayer flags and other gifts to the gods. My thoughts drifted to the lush green forests in Aotearoa, bursting with all sorts of flora and birdlife. It was the start of spring, ploughing time, when we walked into Saldang. In the last of the afternoon sun locals laden with hand-made tools could be seen walking their horses home after a day of planting crops. Towards the end of the season these valleys would be awash with green and families would be hectically harvesting before the bitterly cold months arrived. Here only five to six months worth of food can be grown locally – villagers must embark on long journeys along ancient caravan trails to supplement their home-grown stores. Men often leave their wives and young families at home for many weeks while they traverse high alpine passes, their yaks laden with sacks carrying salt and other goods to trade. This treacherous journey is a way of life, and a journey necessary for survival. After a fair price is agreed on, salt is exchanged for grain and the yak caravans return to Dolpa. In Saldang we stayed in the village’s most spacious house – Labrang – with Tundup, a traditional Tibetan doctor. Eric Valli (director of ‘Caravan’) wrote that Tundup “always starts the day with a short prayer, which he recites to the slow rhythm of a big drum hanging from his private chapel’s ceiling”. 20 years later, the echo still “reverberates in the valley, as if to remind the protective divinities not to forget this handful of people, who obstinately survive in one of the earth’s most inhospitable regions.” But now it’s his two grandchildren sitting in the private gompa at Labrang, while Tundup is quietly turning his prayer wheel in a room nearby. Diary entry: The contrast between the old and the new hits me here. My eyes dart around the room and I see hints of changing times. Stacks of cheap canned beer from China accompany local rice brew, Snickers bars are neatly stacked on shelves next to dried yak cheese, and synthetic clothing peeks out from beneath yak-wool coats. The scent of juniper rises from chimneys. It is the only wood available and is just used to light fires which are then sustained with yak dung. Houses are made of mud and stone and whole villages blend into the surroundings. There is little disconnect between people and nature; everything blends into the land in this high-altitude desert. Even human remains are left for the vultures that can be seen gliding through the valleys, as offerings to the gods. Life is tough, but there is a peacefulness, a sense of contentment and a deep connection with nature evident amongst the locals. On one of our final days in Dolpa – as the monsoon was looming – I found myself perched on a rocky mountain top, mesmerised by gigantic eagles soaring, swooping and diving like kites. I visualised myself soaring high above the vast valleys alongside these magnificent giants with their patterned wingspans. I felt the ancient heart of Dolpa beating strong that afternoon. As our time in this mysterious land drew to an end, I was almost hesitant to turn the final page. I blinked and we were back on a local bus, rattling our way towards Pokhara. We drove into the monsoon rains on our way back to the land of German bakeries, jewellery shops and adventure tourism companies. As for our initial goal of crossing the entire country on foot, we only made it half way on this trip. But I am excited to say that I will be returning in early 2015 to resume walking from where we left off. I have a huge grin on my face just thinking about it! Note: if the people and life in this region interests you, I highly recommend watching the film ‘Caravan’ (also known as ‘Himalaya’ for international audiences) – director Eric Vali does an incredible job portraying Dolpa life. We even met the main character in this film, washing his clothes in a river!